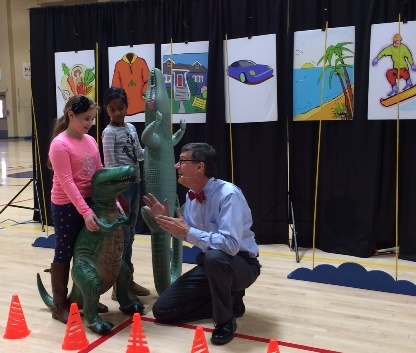 “FUNance - Where Fun and Finance Collide” performed an assembly at Wakelee on Friday. 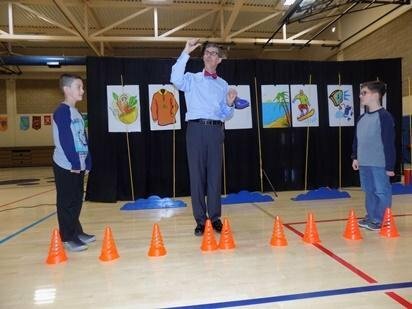 The “FUNance” show uses juggling, magic, comedy, theater and audience participation to engage students in learning about basic personal finance and economic concepts in age-appropriate ways that students can understand, relate to and enjoy. Brad Zupp, also known as “Mr. Z.” is a former Ringling Brothers and Barnum & Bailey Circus clown. He started in show business at nine years old, performing magic tricks for his friends and family. He learned how to juggle three balls when he was 10 years old, and started performing as his job when he was only 12! He was one of the youngest people ever accepted to Ringling Brothers and Barnum and Bailey’s Clown College (at age 17). He has performed all over the world, on circuses, in schools, on cruise ships, in shopping malls and at theme parks. For several years he performed part time while working full time as a financial planner (someone who helps other people be smart with their money). He now performs full time again, using his talents as a juggler and funny person to teach young people how to be smart with money!